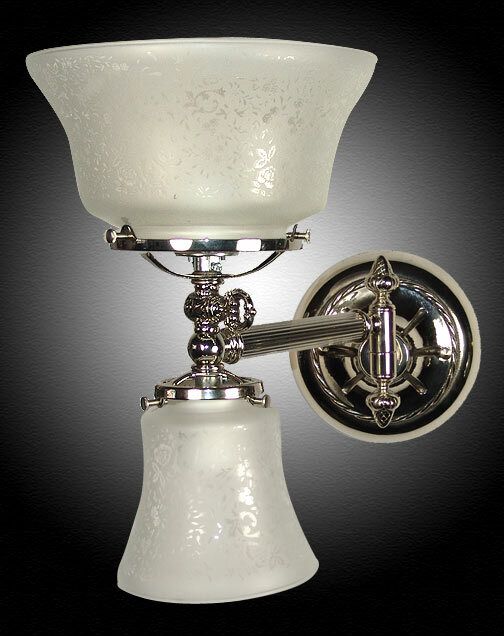 This lovely swingarm gas lighting reproduction, shown in polished nickel, will work well on either side of your bed. Like all of our lighting fixtures, nickel and other metal colors are always available. Add an optional swivel above the lower shade holder for directional lighting! Acid etched French glass and faux gas key really finishes the authentic period accuracy. Shown in Polished Nickel. Available in different Metal Finishes, different Glass, Back Plate, multiple arms and many other Custom Options. Width 7 In. / Projection 15 In. / Depth 12 In.